I already made the shocking confession that I am not a dog person. Today is the day when I tell you that I am a cat person. That’s right, go ahead and make fun of the lady who has ten cats and can’t stop taking pictures of Fluffy in her Halloween outfit and posting them on Facebook. Go ahead, because that lady is not me. I love cats, but I actually don’t have one right now. It’s the first time since age four, other than the first two years of being married, that I’ve been without a cat. The stray cat we dubbed “Mama Cat” who adopted the crawl space under our house as a her birthing place for kittens when I was a little girl had a big impact on my formative years. For two or three years of my childhood, there were two kittens every spring and two kittens every fall. I couldn’t wait to get my hands on those feral kittens and tame them into respectably friendly domestic felines. Actually, my younger sisters did a lot of the taming by carrying them around by the neck and putting them in doll clothes. The last of Mama Cat’s kittens died this summer at the ripe old cat age of eighteen(ish). Though I don’t have a cat right now, I still have a sense that my home is not home without a grey or orange cat curled up in some corner or nook. So yes, I really like cats. It follows that many of the children’s books I like are about cats. Even if you’re not a cat lover, I think you’ll end up admitting that these books are pretty swell. Peppermint is my all-time favorite cat book. Published in 1960, it’s the story of a little kitten born in a candy store who longs for a real home. Each of her brothers and sisters have exciting names like Lollipop and Chocolate Drop. Peppermint, however, is accidentally dropped in a tub of bluing and none of the children want her when they come to look at the other kittens. The story has a happy ending of course, once a lonely little girl accepts that a blue kitten is a cute kitten. Her acceptance of the blue one pays off in the end. I love the illustrations. I wish this book weren’t out of print, because it is in high demand — a used copy will run you about $40. 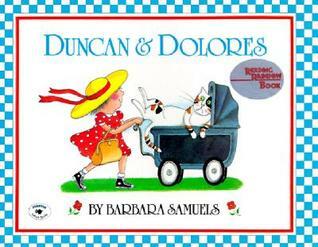 Though it does not cause the same debilitating nostalgia as Peppermint, Duncan and Dolores is my next favorite cat book. Dolores is the little girl created by author and illustrator Barbara Samuels who manages to drive her sister and her cat crazy, depending on the book she’s in. Duncan is the cat that is loved but misunderstood. Faye tries to coach Dolores in how to relate to her newly adopted cat, but Dolores thinks Faye has it all wrong. I’d say Dolores is a dog person who wants to be a cat person. You know how you watch those really fun adults try to relate to really shy small children? Imagine that scenario, but in a permanent way. Dolores learns as she goes, but the book is mostly just plain entertaining and funny. I pull The Christmas Day Kitten out every Christmas. It’s more of a decoration than a reading tradition at this point, because the book is lengthy and the ending rather sad. 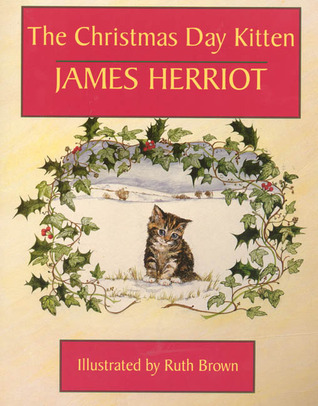 I don’t think my two-year-old and four-year-old will appreciate it for many years, but I love the warmth of the illustrations and the familiar story-telling style of James Herriot. Ditto for Moses The Kitten. Just as I am quite enamored with a few of the dogs in children’s books, I’m absolutely sure you will like these books, even if you’re not planning on becoming a cat person any time soon. This is Day 28 of the 31 Days of Picture Books Series. See all the posts in the series here. Love Peppermint! Good to meet another person who has fond memories of it. I enjoy your blog. Thanks, Jennie! It’s great to hear from other book lovers. 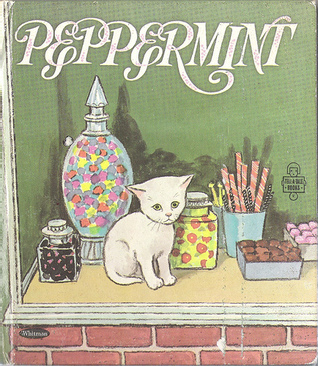 Oh, my goodness, I had Peppermint as a child and loved that book! I hadn’t thought of it in ages. I wonder which of my siblings has it now — or maybe it’s still at my parents’ house! I know! I’m going to be searching my parents attic for several books I’ve been thinking about during this 31 Days series. Peppermint is at the top of the list.